This tan brown leather macbook sleeve is specifically designed to suit popular 15 inch laptops with ease. Handcrafted in the heart of Italy using full grain leather, this slim and sleek accessory has been designed to last a lifetime and always look the part. The internal dimensions of this laptop sleeve perfectly hold your 15 inch PC in place whilst keeping it secure and protected. 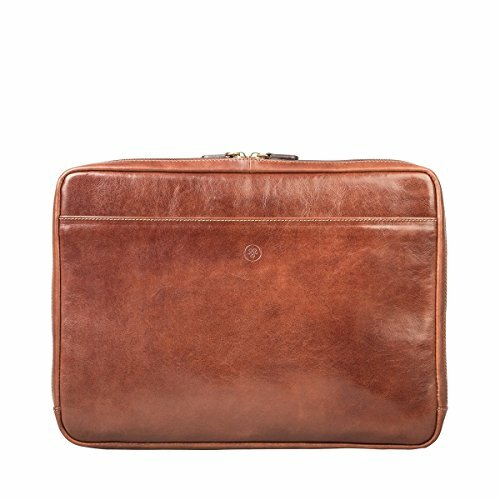 The front external pocket of this leather macbook sleeve is ideal for holding documents, reading material or even your instructions booklet. The slim design of this laptop case makes it perfect for putting into bags or briefcases but can just as easily be tucked under your arm. This luxury leather macbook sleeve would make an ideal gift to give to a loved one. We are dedicated to the total satisfaction of each and every customer. We are aware that our best tan leather macbook sleeves are certainly not the cheapest on Amazon, however once you have bought and owned a Maxwell Scott product; you will understand that they offer incredible value. Handmade in Italy by master craftsman. An elegant and handy home for your 15 inch laptop - Also comes with a 25 Year Warranty! Internal Dimensions: Width - 38cm / 15inch, Height - 28cm / 11inch. Front external pocket to front. Suitable for most 15 inch laptops. Lightly padded to interior for protection. Handmade from luxury Italian leather. YKK metal zip opening - three sided. Height = 31cm / 12.2 inch Width = 40.6cm / 16.0 inch Depth = 4.5cm / 1.75 inch Weight = 0.54 kg.